Hyde Park is the largest of the Royal Parks consisting of 142 hectares of grassland, flowerbeds and trees surrounding a central lake – the Serpentine. Together with Green Park, St James’s Park and Kensington Gardens Hyde Park forms a virtually unbroken strip of parkland from Westminster in the east to Kensington in the west. Hyde Park is delineated from Kensington Gardens to the west by the West Carriage Drive which runs north-south between Hyde Park and Kensington Gardens. The park is open 24 hours a day unlike Kensington Gardens which closes at dusk. The land belonged to Westminster Abbey in the Middle Ages but was taken over as a hunting ground by Henry VIII in 1536 when it became a Royal Park. Since then it has remained open space, initially because of the love of successive monarchs for the chase. 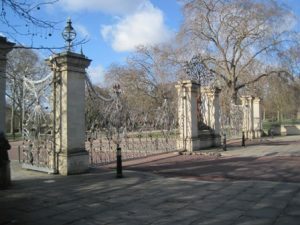 From the time of James I public access to the royal parks has been increased and Hyde Park was the first Royal Park to be opened to the public in the early 17th century. Initially the parks were only frequented by the upper classes however they have gradually become pleasure parks for all. Hyde Park will host the Olympic Triathlon and Olympic Marathon swimming events in 2012. These will be held in The Serpentine. Rotten Row is a corruption of the phrase “route de roi” (The King’s Road) down which kings would ride to hunt deer in the park. Towards the end of the 17th century Kensington Palace became the main royal residence and the king had to travel between the palace and St James – which remained the official residence of the sovereign – through the park which was notorious for thieves. William III had the route lit with 300 oil lamps making it the first ever illuminated highway in Britain. Rotton Row is now used by the Household Cavalry Brigade for exercising their horses and at around 10:30 and noon members of the Brigade use the carriageway while riding to and from the Changing of the Guard ceremonies at Buckingham Palace and Horseguards. Rotten Row formed the northern boundary of the site of the Crystal Palacewhich housed the Great Exhibition of 1851. After the exhibition the Crystal Palace was moved to Sydenham Hill in South London. Speakers’ Corner is located at the north east corner of Hyde Park near to Marble Arch. Every Sunday since the 1870s orators, both eccentric and serious alike, have brought their soap boxes to stand on and hold forth to the crowds at Speakers’ Corner on every subject under the sun. Speakers’ Corner is the only place in Britain where demonstrators can assemble without police permission and the law allows anyone to speak on any topic as long as they do not breach the peace, incite racial hatred, blaspheme or use obscene language. There have been enormous gatherings here over the years and Speakers Corner has been frequented by such orators as Karl Marx, George Orwell and the Pankhursts. The Marble Arch was designed by John Nash in the 1820s and was moved to its current position from Buckingham Palace in 1856 to make way for new buildings. A nearby plaque indicates where the notorious Tyburn Gallows once stood. It is against the law for anyone except a member of the Royal Family or the ceremonial King’s Troop Royal Horse Artillery to pass beneath the arch, but this is not enforced. The Sepentine lake was created in 1730 by damming the River Westbourne. A beautiful bridge built in 1826 by George Rennie crosses the water and separates the lake into the Long Water to the north and the Serpentine to the south. Paddle boats can be rented from the Serpentine boathouse and the Serpentine solar shuttle boat uses solar power to ferry passengers from the boat house to the Princess Diana Memorial Fountain in Kensington Gardens. Swimming is allowed at the Lido on the west bank and members of the Serpentine Swimming Club come here for a dip between 6am and 9am every morning, even in the depths of winter. At Hyde Park Corner there used to be a tollgate for traffic to and from London. Apsley House to the north of the modern roundabout was built in the late 18th century and was sold to the Duke of Wellington who lived there until his death in 1852. Apsley House contains memorabilia of the Duke of Wellington, and the Wellington Gallery on the first floor contains paintings by Velsasquez, Rubens, Van Dyck, Brueghel, Murillo and Goya. Apsley House was the first house travellers saw in London after passing through the tollgate and as a result became was therefore known as No 1 London. Next to Apsley House is the Grand Entrance to the park with a triple arched screen designed by Decimus Burton in the 1820s. At the centre of the roundabout is the neo-classical Wellington Arch which was also designed by Decimus Burton in the 1820s to celebrate Britain’s victories in the Napoleonic wars. The nearby statue of the Duke of Wellington astride his Waterloo charger used to sit on top of the arch, but this was replaced in 1882 by the current statue of Peace driving a chariot and 4 horses. The Wellington Arch has an exhibition on the first floor relating to the blue plaque scheme (the blue plaques on buildings around London commemorate the link between notable figures of the past and the buildings in which they lived and worked). On the second and third floor of the arch is exhibition space dedicated to triumphal arches around the world. The views from the balconies of the arch are superb and include vistas of the gardens of Buckingham Palace.